Fifty years ago this month, Elvis Presley received an honorable discharge from the U.S. Army following two years of active service. His time away did little to temper his ubiquitous presence on the radio, however—he had recorded a small surplus of tracks prior to his first deployment, which helped—as raucous hits like “A Big Hunk o’ Love" and “Hard Headed Woman” received steady airplay while he was gone. 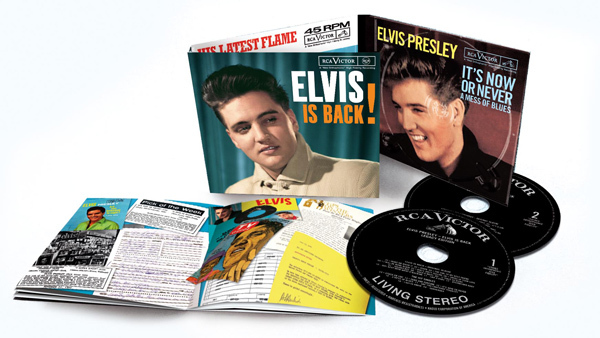 Reissued this week by Sony Legacy in a deluxe two-disc set is the album Presley recorded upon his homecoming—aptly titled Elvis is Back!—which finds him demonstrating both versatility and an affinity for handling a range of song styles. He would engage the latter often and to rather saccharine extremes much later in his life, of course, but his performances here are for the most part very good and hold up well today. Singles like “It’s Now Or Never” and “Stuck On You” (which weren't on the original LP, but are included here) still sound enthralling, but the real payoff comes in listening to Presley flat-out own lesser-known gems like “It Feels So Right” and Leiber and Stoller’s “Dirty, Dirty Feeling” with rambunctious, youthful urgency. Indeed, this is a 25-year-old man on these recordings, healthy and happy to be back in the thick of his music career. Even in the album's most maudlin, sentimental moments (“I’ll Be Home Again,” to cite but one example) Presley’s chief redeeming quality—his voice—saves the song. Filling out the set is the album’s follow-up, Something For Everybody, which besides its included singles (“Little Sister” and “Good Luck Charm,” among them) is even more of a hodgepodge of styles, and comparably far tamer, than its predecessor. Yet Presley invests so much conviction and charisma throughout—whether on a drowsy ballad like “Sentimental Me” or the superior, blues-drenched cut, “I Want You With Me”—that he ultimately wins you over. In fact, he does that all through the music on this set.